Model 700.01 is particularly intended for the monitoring of differential pressures even in the case of high working pressures in gas and air preparation and supply systems. Model 700.02, the version with a separation diaphragm, is suitable for liquid media and therefore also for water treatment and supply systems. 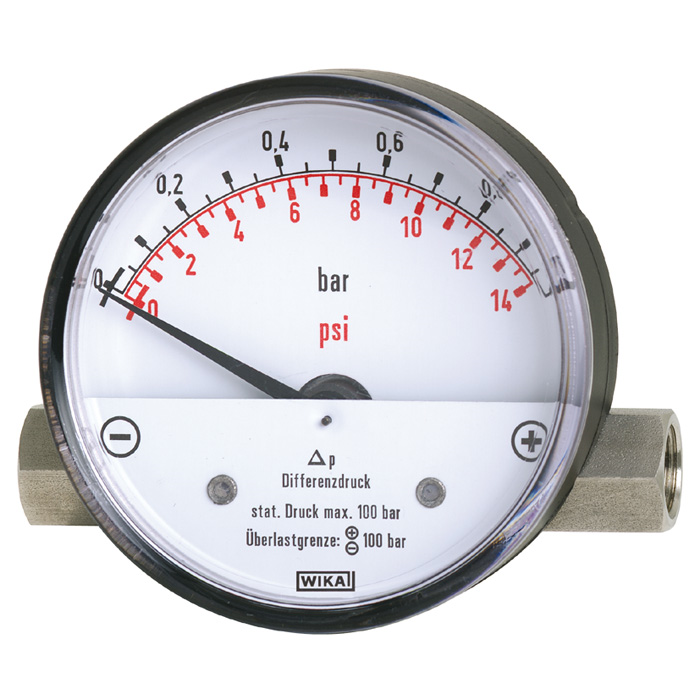 This piston-type differential pressure gauge offers special advantages due to its compact modular design. For instance an on-the-spot replacement of measuring system and case of indication is possible in retrospect and the Reed contacts can also be retrofitted and adjusted locally. A front surface mounting flange may be retrofitted on model 700.01. Although these models have a high overload capacity either side up to the maximum working pressure, the weight of the standard versions, i.e. approx. 220 g in the case of model 700.01 and approx. 500 g in the case of model 700.02, is extremely low. Therefore, these gauges provide an economical and flexible solution to your measuring task. This compact design with a measuring system of stainless steel enables an optimal price/performance ratio.